Walking On Air: Your 30-Day Inside and Out Rejuvenation Makeover by Susan Smith Jones, Ph.D. + FREE Detoxify & Rejuvenate Booklet - Penn Herb Co. Ltd. Discover how to create a life of robust self-esteem, vibrant physical health, and a deepened spiritual consciousness. 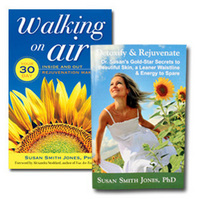 Holistic life coach, Dr. Susan Smith Jones breaks down life changes into a manageable 30-day plan. Learn how to make simple, yet effective choices with your food, your relationships, your lifestyle, and your state of mind.